DONATE -- BE A RAILROAD BUILDER! SPONSOR THE RAILROAD -- BE A PART OF RAILROAD HISTORY! Sponsor a piece of history. Naming opportunities over $10,000 can be financed over a 3-5 year period. Your leadership will be recognized by a prominent plaque by the resource you've sponsored. Unless otherwise indicated sponsorships are for a 25-year duration for a one-time gift. 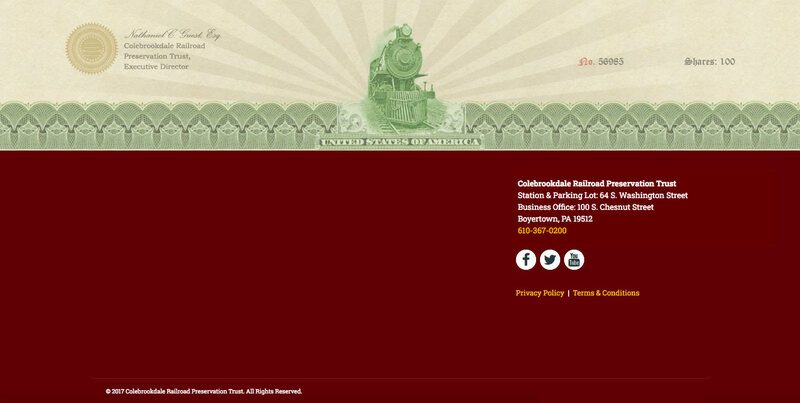 Make a commitment to benefit the Colebrookdale Railroad through a gift that costs nothing during your lifetime. Contact us to learn more about Planned Giving opportunities. The IRS encourages plans that stretch your giving ability. Contact us about establishing a Charitable Remainder Unitrust or a Charitable Remainder Annuity Trust. Here are a few benefits: A potential increase in the income you are currently receiving from your investments; an immediate tax deduction for a portion of your gift; no capital gains tax due at the transfer of appreciated assets to your gift plan. Charitable Bargain Sales - part gift, part sales transactions that allow you a charitable deduction plus put cash in your pocket. Charitable Lead Trusts - use your assets to make gifts today and pass them back to family members later, thereby freezing their taxable value. Contact us about including the Colebrookdale Railroad in your will, about gifting your retirement plans, about gifting appreciated securities, or about gifting life insurance. Gifts of securities afford donors an attractive means of giving to the Colebrookdale Railroad. Donors receive a tax deduction for the market value of the securities, computed on the day of their transfer, while avoiding payment of capital gains on the stock's appreciated value. Learn more about gifts of Stocks and Securities.